We Scottie Moms have to be quick on our feet. 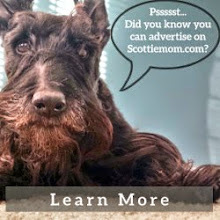 You just never know what our Scottish Terriers might come up with to surprise us, teach us something new and make us better Scottie Moms. The learning curve never seems to end. And as someone who had not previously owned a dog of my own before, my Scottie Mom learning curve skyrocketed the minute Mr. K entered my life. I am curious about Fiona and Winston's behavior, whether they love to be around me or are scared to lose me due to their past. I was wondering if you could ask other Scottie parents about their experiences. Winston was always an indicator where I was. My ex would look for Winston to know which room I was in...Now that my ex is out of the picture, [Winston] only needs to be in the same house. Fiona, on the other hand, would sleep on the couch - never in my room. She would also go to the bedroom if I were in the living room. Now, she is my little shadow but not to extremes. She'll be in the living room if I am in the kitchen, craft room if I am there and only needs to be at my door while I am bathing, never underfoot. So, is this typical Scottie behavior or rescued love? 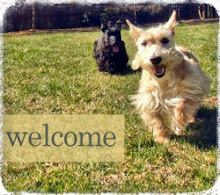 I think the best way to approach this is to recognize that every Scottie is different and with rescue Scotties like Winston and Fiona, it is impossible to know what they have been through before finding themselves happily in your home. That being said, Scotties are also independent creatures. Take Heather, for example: she prefers sleeping in corners of rooms away from everyone but not so far that she can't see everyone. I think that's her way of keeping her independence while looking out for those she loves. On the contrary, I was told after boarding them for the first time that Heather wouldn't let Mr. K out of her sight for an instant - that part, I'm afraid, was more reassurance for herself that I hadn't abandoned her rather than concern for Mr. K.
In the past, Mr. K's behavior has been similar to Winston's when it comse to ex-boyfriends. Some, he'd never let get too close and others, he'd roll right over for a belly rub. He also would lead Scottie Dad to me when I wasn't well and, at other times, was quick to warn those (Scottie Dad included) he didn't yet trust not to mess with his Scottie Mom...or else. That being said, I am a true believer in an animal's instinct - especially a Scottie dog's. If the Scottie doesn't like the person you are with (friend or otherwise), take that as a cue. At some point or another, both Heather and Mr. K have acted as my shadow - or at least, it appears that way. It can be hard to tell which of us is following the other in our 850-square-foot apartment! When it was just Mr. K and me, there definitely was some separation anxiety...especially after I lost my job and was at home with him for nearly four months straight. I often made random trips to the grocery store and such just to give him some alone time so he wouldn't become completely dependent on my presence. To this day, though, if Mr. K was given a choice, his preference would be to be by my side...and, truth be told, that would be my choice as well! So, all in all, I would weigh in saying that Winston and Fiona are exerting typical Scottie behavior - however, this opinion is limited to my experiences with Heather and Mr. K. With that in mind, I'd like to offer up the opportunity for other Scottie Moms and Dads to weigh in on the topic below so we can keep the Scottie Mom (and Dad!) learning curve going. Much love, The Scottie Mom. Marlee isn't a rescue, but he tends to sticks right with me. He's my little shadow. This has been more prevalent since the end of December and the passing of his Dad. Marlee and his Dad had a special bond. He misses him so much. I keep a picture of him and his Dad on his eye level. He stops and looks at it many times a day. I think he's afraid I might "go away" too. All my Scotties (all home-bred) were all very different. Some aloof, others wanting to me a part of the "gathering" The two boys I'm left with are very clingy. Finlay will seek out the room I'm in, find a comfy spot and fall asleep. Bobby will get desperate if he can't find me straight away and make a little whimpering noise on entering each empty room. Once I call out to him and he realises where I am he becomes contented. They are both 10; I took early retirement 5 years ago and so they are both very used to me being around; should I go out for several hours I "get told off" by them on my return - they "herd" me into the lounge for lots and lots of fuss. It's also a race into the bedroom at bed time and I have to fight for space - but I wouldn't want it any other way! I've got two scotties, my girl Pippen isn't a rescue and my boy Jacque is. He is definitely the one who follows me around more. He usually wants to be in the same room as me and has been known to follow me even in a small room (like from my sewing machine to the ironing board about 5 feet away!). Pippen will often wander off to "put herself to bed" in the bedroom or nap in the dining room or shower (don't know how that started!). Jacque will also wait nose to the door when one of us leaves. But when we leave them (albeit it's with my in laws and they know them) he is the one who is at ease and Pippen is the one who gets sad and will mope around until we come back. Darwin isn't a rescue dog but he's my shadow around the house and garden. He's almost 2 and lies at my feet constantly. However, when we're out walking he practically ignores me. Too busy and excited! Once my dad, who he's very close to jokingly hit me with a newspaper, Darwin didn't like it and jumped up and growled at my dad, much to our shock. I often wonder if he's trying to look out for me because I've a quite serious medical condition. But perhaps it's just typical Scottie behaviour! thanks to all who have answered. Funny enough, Winston will give my finace' more kisses than he will give me=guess he knows who loves me and who he can trust. Fiona is still a bit skittish, but will allow her 'scottie dad to be' to pet her, and of course,give her treats. And neither of them hestitate to give attitude...I get the 'arrooooo's' and he gets the 'look' from under the eyebrows. And it's all good! We have two Scotties, Haggis and Lucy that we have had since puppy-hood. They are both two years old. Haggis will follow me around at home and lie and snooze at my feet or next to me. Lucy will find a quiet spot during the day and have a snooze away from the bustle around the house. At night thought it is a different story. Haggis wants to sleep on the bed but the-haggis-may-not-be-touched (this the boy who would lie with his head on my feed under my desk) or cuddle in his dad's arms like a baby. Lucy will wriggle her way into 'my' spot on the bed and something must touch me (usually her little behind), but even if I just hold on to a little paw she is happy. After dad takes them for a late night stroll he is just not important anymore, then they only want mom. 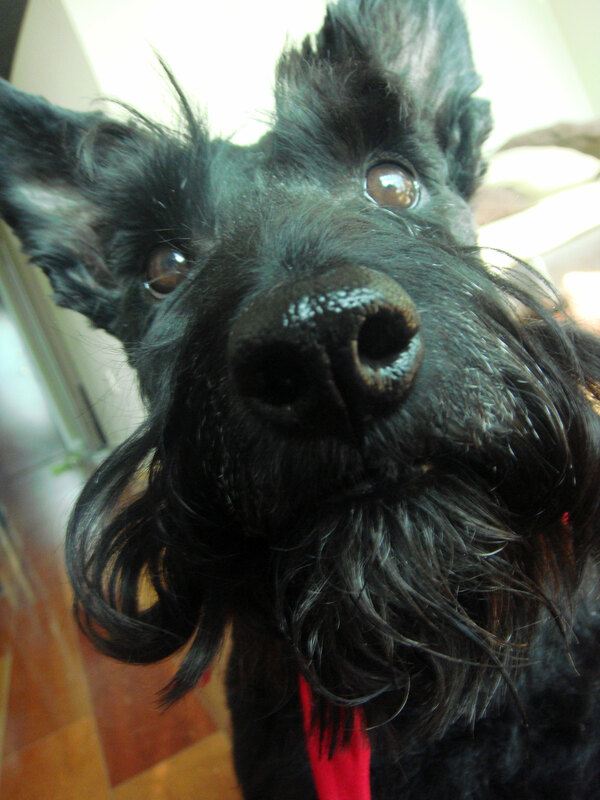 My Scottie, Abby, is much like Winston. When we adopted her,they told us she was afraid of men. Unfortunately, 3 years later, she is still afraid of my husband (and all other men). So, when he is home, she is my little shadow and needs to be in the same room as me, usually sitting right next to me. When he's not home, she tends to be OK in another room--although she is almost always nearby in an adjoining room or hallway. I think she operates with a mix of fear (needing to be by mom when a man is around) and independent Scottie behavior when a dreaded male is not around. She also likes to be near her sister Gracie, a standard schnauzer mix we adopted a few months ago. Winston has one trait I am very curious about-no one, except his vet and I-are allowed near his face-no other dogs, not even Fiona.He gives 'kisses' to his Scottie-dad-to-be, but only upon request. Is 'no face contact' norm or just a by-product of his puppy mill (that's what I was told he was at when rescued) days, or just a "I'm Winston and that's just me' trait? thanks! I'm not a cuddler. You might think that 10 years after being rescued, I'd want more touching. But no, I follow Him from room to room and I do allow belly rubs. My little guy is mostly content on being in the same room as me. He is a cuddler too though and when he wants to be cuddled you better do it, or your getting pestered to death. LOL. If I go to another room and pull the door closed but not latched, you can bet there will be a scottie nose pushing it open. That can be rather annoying when I'm changing clothes, because he will sit in the doorway and anyone who walked by can see me. LOL. I like a cuddle, but I'm not overly clingy. I dont always have to be in the same room as my peep, but I always wiggle my tail when she walks in the room! Uncle Fergus on the other paw, loved my peep's mum, he followed her everywhere! If she went to the loo he'd sit outside the door and whine!